Born in Minneapolis, Minnesota, and raised in a family of Hungarian labor organizers, Steven Brust worked as a musician and a computer programmer before coming to prominence as a writer in 1983 with Jhereg, the first of his novels about Vlad Taltos, a human professional assassin in a world dominated by long-lived, magically-empowered human-like “Dragaerans.” While writing, Brust has continued to work as a musician, playing drums for the legendary band Cats Laughing and recording an album of his own work, A Rose for Iconoclastes. 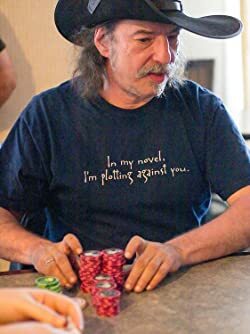 He lives in Las Vegas, Nevada where he pursues an ongoing interest in stochastics. Click here for more stories by Steven Brust. Vlad Taltos — (1983-2017) These take place in the same universe as the The Khaavren Romances and have some overlapping characters. Nineteen novels are planned. Omnibus and audio editions are available. Publisher: Quick with both sword and wit, Vlad Taltos makes his way through the world of Dragaera as an assassin, aided by a small talent for magic and a lizard-like jhereg companion. Loveable assassin Vlad Taltos is back in Yendi, the second in Steven Brust’s VLAD TALTOS series. 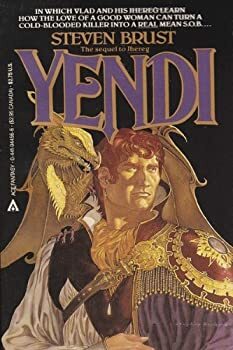 Yendi is actually a prequel to the first novel, Jhereg which introduced us to Vlad, his wife Cawti, his familiar, and several of his friends and enemies. Vlad is a new mob boss who is trying to protect his territory from the encroachment of neighboring mob bosses. When one of them sets up a racket in Vlad’s territory, Vlad has to take him on. As usual, he’ll need all his wits and all his friends just to stay alive. 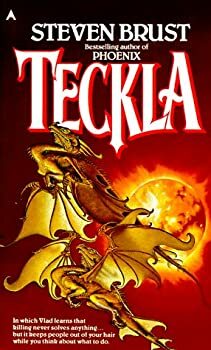 Teckla is the third novel in Steven Brust’s series about Vlad Taltos, a human assassin who lives in the empire of Dragaera which is populated mostly by a species of long-lived tall humanoids who were genetically engineered by sorcerers and divide themselves into clans depending on their specific traits. In the first VLAD TALTOS novel, Jhereg, we met Vlad, an Easterner whose father bought the family into the nobility of the lowly house of Jhereg. Vlad, like many of the Jhereg, is a crime boss and controls a portion of the city of Adrilankha. In the second book, Yendi, we learned how Vlad met his wife Cawti when she was sent to assassinate him. He died but was revivified by his minions and married Cawti. 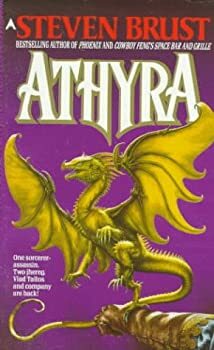 Athyra is the sixth book in Steven Brust’s VLAD TALTOS series. 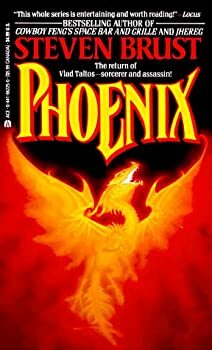 If you haven’t read the previous books, you should probably skip this review until you’ve read Phoenix so that I don’t spoil its plot for you. I’m listening to Bernard Setaro Clark’s narration of the audio versions (Audible Studios) of VLAD TALTOS. Athyra is 8.5 hours long on audio, though I increased the playback speed, as I always do, so it was shorter than that for me. 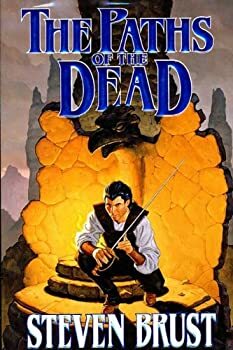 Bernard Setaro Clark’s narration continues to be excellent and I recommend the audio format for this series. Orca is the seventh book in Steven Brust’s VLAD TALTOS series. It’d be best to stop here if you haven’t read the previous books. We don’t want to spoil anything, do we? Dragon is the eighth novel in Steven Brust’s VLAD TALTOS series. 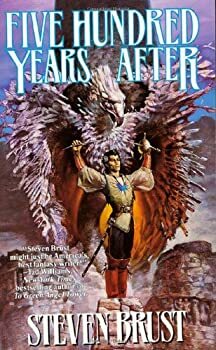 As you’re reading the series, it probably doesn’t matter when you read Dragon since it’s really a stand-alone story which tells of a battle that occurred earlier in the series’ chronology, just after the events of Taltos, which was a prequel to the first three VLAD TALTOS novels. (As you can see, the books jump around in time). 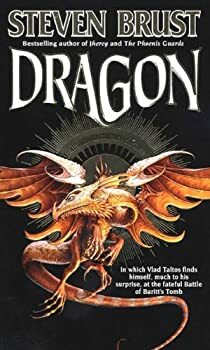 But Dragon is not one of the better volumes, so I wouldn’t recommend, say, reading it first and basing your judgment of the entire series on this novel. Read Jhereg, Yendi, Teckla and Taltos first. 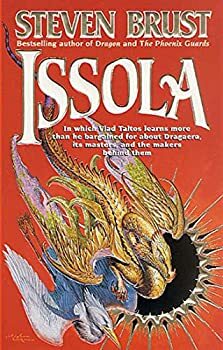 I’ve been slightly disappointed with the last few novels in Steven Brust’s VLAD TALTOS series, but with Issola, book 9, Brust returns to what I liked about the earlier books. 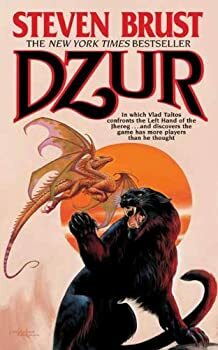 While I admired Brust’s willingness to experiment with his world, his characters, and especially the narrative structure of his novels, I think he’s best when the overall plot is moving forward and Vlad is using his assassin skills to solve mysteries and help his powerful Dragonlord friends. 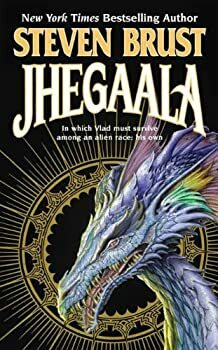 Jhegaala is the 11th novel in the excellent VLAD TALTOS series by Steven Brust. In case you're not familiar with the series, Vlad Taltos is a human assassin living in the Dragaeran empire. Dragaerans are human-like, but live for 1000 years or more and have a complex society divided into 17 Great Houses which all bear some resemblance to a real or mythical animal. So we have the Houses of the Orca and the Hawk, but also the Houses of the Dzur, Dragon, and Jhegaala. Since humans are not part of the Empire, Vlad's father bought his son a title in the House of Jhereg — which is named after a reptilian scavenger and is basically the crime syndicate of the Empire. 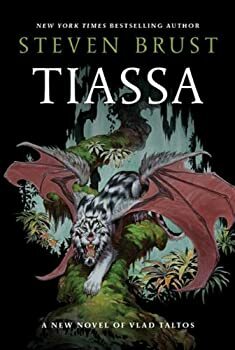 Tiassa is the thirteenth Vlad Taltos novel by Steven Brust, and counting Brokedown Palace and The Khaavren Romances, the nineteenth book to date set in Dragaera. Over on tor.com (where this review was also published), Jo Walton has written an excellent series of blog posts about the series so far so I won’t waste your time trying to summarize this amazing series and instead direct you to Jo’s spoiler-free introduction just in case you’re new to Dragaera. Note: This review contains spoilers for previous novels in the series. 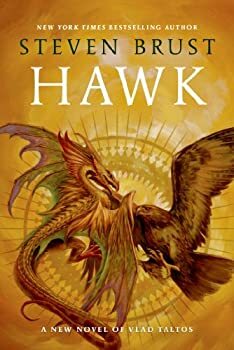 Hawk is Steven Brust’s fourteenth (and latest) novel about Vlad Taltos, a charming assassin living in Dragaera. Over the past 31 years, fans of this series have been through a lot with Vlad and Loiosh, Vlad’s flying reptilian familiar. 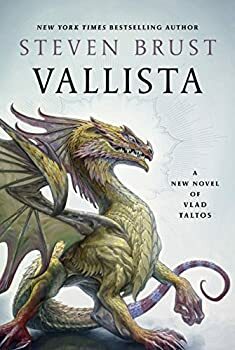 Everyone’s favorite Jhereg assassin is back in Vallista, Steven Brust’s fifteenth VLAD TALTOS novel. If you’re not familiar with this series, don’t start here. Get a copy of Jhereg and read the books in publication order (which is not, by the way, the same as the internal chronological order, but that’s okay). Let me recommend the audio versions produced by Audible Studios and read by Bernard Setaro Clark. 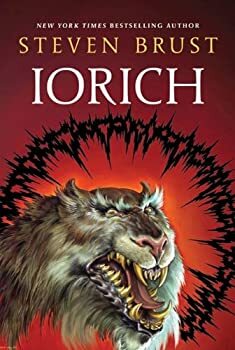 He does such a great job capturing Vlad’s sarcastic personality and the amusing dialogue between Vlad and Loiosh, the reptilian familiar who rides around on Vlad’s shoulder. The Khaavren Romances: Two prequels and The Viscount of Adrilankha Trilogy — (1991-2004) Publisher: The Dragaeran Empire is a hotbed of intrigue, sorcery, intrigue, swashbuckling adventure, and intrigue. For those who would be heroes, it is a delightful time to be alive — and an easy place to die. Khaavren of the House of Tiassa is a son of landless nobility, possessor of a good sword and “tolerably well acquainted with its use.” Along with three loyal friends, he enthusiastically seeks out danger and excitement. But in a realm renowned for repartee and betrayals, where power is as mutable as magic, a young man like Khaavren, newly come from the countryside, had best be wary. His life depends on it. And so does the future of Dragaera. When swordplay beckons, it’s all for one — and one for… The Phoenix Guards. 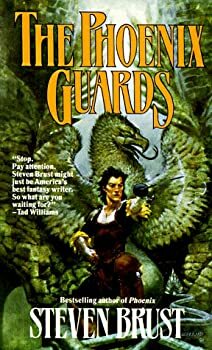 The brief review: I had a slight smile on my face the entire time I read The Phoenix Guards. It is, as a reviewer of The Three Musketeers might have once said, "charming." To elaborate: Steven Brust is very well (some might say "over") educated and knows how to turn a phrase. The plot moves along briskly; the characters, while not fleshed out too thoroughly, do have distinct and effective personalities. I was, at first, a bit lost about the world's/realm's infrastructure of Houses and about the characteristics of each (and what animals the fantasy names correlate to). However, I've not read the Vlad Taltos series, which apparently sheds some light on those matters. 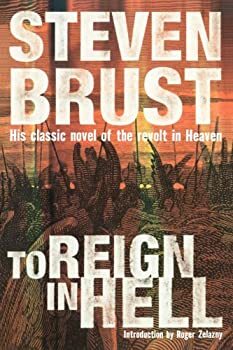 If there were justice in the literary world, you'd think Steven Brust would have received more acclaim and notice, as Brust's writing is crisp and lively, his pacing excellent. As explained in an "interview" with the book's pompous narrator, Brust writes for those who love to read, i.e. those who enjoy a good vocabulary, good grammar, good phrasing, and (indeed) a good story. This is not some "page-turner" to be engulfed at one-sitting; if you did that with a box of Godiva chocolates, you'd become ill and lose the appreciation for each one. Just so with each of the book's chapters. The plot does slow a little too much in places — often due the musings of the intruding, over-erudite narrator — but there are worthy adages, tales and metaphors therein; don't miss them. The Incrementalists is collaboration between authors Steven Brust and Skyler White. I was more familiar with White going in, having enjoyed her trippy novels and Falling, Fly and In Dreams Begin. My experience with Brust’s vast catalogue was sadly limited to having read The Sun, the Moon, and the Stars many years ago while obsessively collecting the FAIRY TALE SERIES. 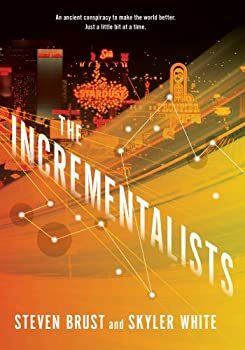 In The Incrementalists, Brust and White team up to create a millennia-old secret society dedicated to making the world better... incrementally. The accomplishments here are nothing short of spectacular. Imagine writing a book populated with some of the most well known characters in Western history: Yahweh, Jesus, Satan, Lucifer (yes, they are separate), and the archangels Michael, Raphael, and Gabriel. They all need unique personalities. If they're not, if they're retreads of biblical, Dante, Milton, or others, then the book fails. Then imagine creating a reason for God to create the Cherubs, Seraph, Thrones, Dominions, Virtues, etc. Give all of them a purpose. Imagine creating Heaven, giving essence to creation itself — a Big Bang, in effect. Imagine giving reason for the Fall. Not just the reason given in The Revelation, but a rewriting, of sorts, and one that absolutely has to make sense. Experienced police man Mike Stepovich anf his green partner Durand apprehend a gypsy suspected of murdering a shopkeeper. Stepovich immediately notices something strange about the gypsy and does something he's never done in his long career. He fails to turn in the knife the gypsy is carrying. Somehow he knows the gypsy is not the murderer and the knife is special. Later that night, the gypsy disappears without a trace from the police cell they are holding him in. Murder investigations are not the territory of an ordinary patrol cop but this case does not let him go, especially when the body of an old gypsy woman turns up. Again, the suspect Stepovich and his partner arrested seems to be involved and Stepovich is determined to find him. His search will lead him into a supernatural power struggle the existence of which he never suspected. The Foundation, a secretive government agency, collects people who have magical powers and puts them to work for minimum wage. They are tasked with keeping evil magic users under control while ensuring that normal people don’t find out that magic exists. In Good Guys (2018) we follow three of these folks: Donovan, Susan “Hippie Chick,” and Marci. At the Foundation’s direction, they are working together to investigate a string of magical murders which are getting progressively more gruesome and seem to have a particular end-game in mind. Donovan, Susan, and Marci investigate crime scenes, find clues, make deductions (and huge leaps of logic), and attempt to find and stop the killer before the killer gets them. Brokedown Palace — (1986) Publisher: Once upon a time there were four brothers who ruled the land of Fenario — along with a goddess, a wizard, an enigmatic talking stallion, and a very hungry dragon — and lived in a crumbling, Brokedown Palace on the banks of the River of Faerie. Beneath the palace the foundations trembled, for something was rotten in Fenario. The Sun, the Moon, and the Stars — (1987) Publisher: Once upon a time there was a kingdom that lived in darkness, for the sun, the moon and the stars were hidden in a box, and that box was hidden in a sow’s belly, and that sow was hidden in a troll’s cave, and that cave was hidden at the end of the world. Once upon a time there was a studio of artists who feared they were doomed to obscurity, for though they worked and they worked, no one was interested in the paintings that stood in racks along their studio walls. The Sun, the Moon, & the Stars is a tale of two quests, of two young men who are reaching for the moon. And the sun. And the stars. Cowboy Feng’s Space Bar and Grille— (1990) Publisher: Cowboy Feng’s Space Bar and Grille serves the best matzoh ball soup in the Galaxy, and hires some of the best musicians you’ll ever hear. It’s a great place to visit, but it tends to move around — just one step ahead of whatever mysterious conspiracy is reducing whole worlds to radioactive ash. And Cowboy Feng’s may be humanity’s last hope for survival. 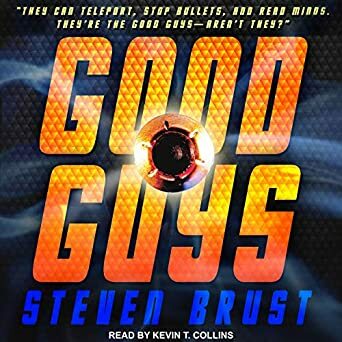 Steven Brust’s time-traveling, science fiction thriller is a rollicking, fun read. 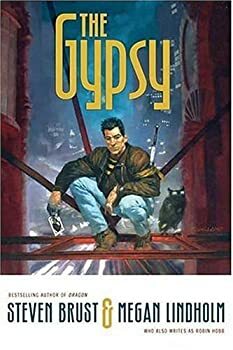 Agyar — (1993) Publisher: A novel of immortality — and its price. Born over a century ago, Agyar was once a frivolous young man, before he found unwanted immortality in a woman’s blood-red lips. Now he goes from woman to woman, and decade to decade, finding himself at last in an Midwestern college town, where he must choose between the seductions of salvation — and of destruction.